Going through a separation is hard enough as it is, without even considering the financial changes your about to undergo. Unfortunately, you have to consider those changes in order to create a better future for yourself and any children you have with your ex-partner. The longer you put that organization off, the worse it will be in the long run. A clean break is always best, and change is not necessarily a bad thing. 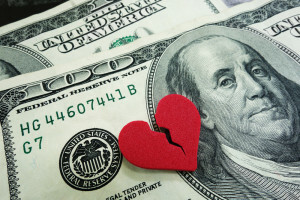 The key point to remember when going through a divorce is that the longer you hold out on that necessary change, the more hurt you get – whether that be financially or emotionally. Being healthy in your single finances will set you up for a happier future in your business and private life, and will remove the threat of an angry fallout between you and your ex over alimony or the like. When it comes to your finances post-divorce, change is the order of the day. Obviously, you’ll have a long list of credit cards, insurance schemes, policies and even bank accounts which have both of your names on them. These will all have to be changed to accommodate for the separation. If you can get your ex to participate in this, you’ll end up saving a lot of time and money, as you’ll be able to cancel or alter financial details and cards which you had together. Once that’s sorted out, you’ll have to account for new financial expenses. A lot of the things you handled together financially, will come off your finances and you’ll need to be prepared for those changes. Invest in your own accounts, but make sure to accommodate for any children you have. With all these new financial obligations to take into account, it’s important to set up a new financial budget for the future. The first thing you’ll need to do is sit down and assess you expenses and income and figure out your net worth. Then review the income you do have a develop a set budget, taking into account all the new financial expenses you have which are included in your structured settlement. Understand that payments on the house or car – depending on who got what during negotiations – are going to be your obligation, and you need to account for that in your budget. Be sure to renew your insurance, health and otherwise, in order to benefit in the long run. Set out a list of goals for your financial future and budget on how you can achieve them in the long-run. Most importantly, don’t pile too much on your plate at once and try to come up with an equitable solution to your expenses. A lot of payments can be managed efficiently if you approach the creditors openly and organize a solid payment plan. Setting up a year-by-year plan with your goals in mind will help you limit negative impacts on your bank balance – which is hopefully your own since you changed all those details, right? If you’re ever in doubt about your income and expenses, or how everything adds up, then approach a financial advisor, who can help you clear that muddied water.